The only place I had for a shop was the carport which is 19×19. 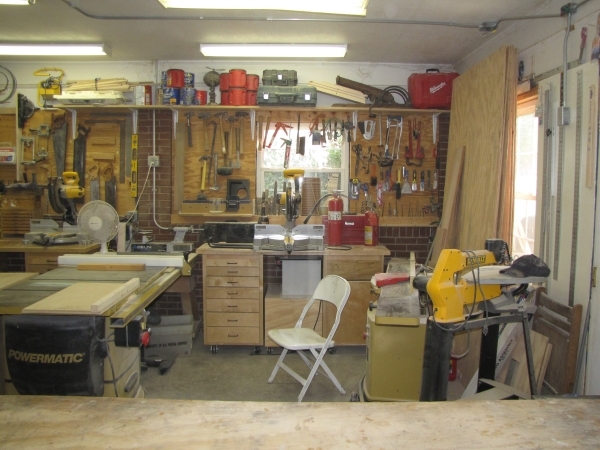 About six years ago I closed in the carport and built a quick workbench, a stand for my toolbox, and I already had a couple of wall workbenches. 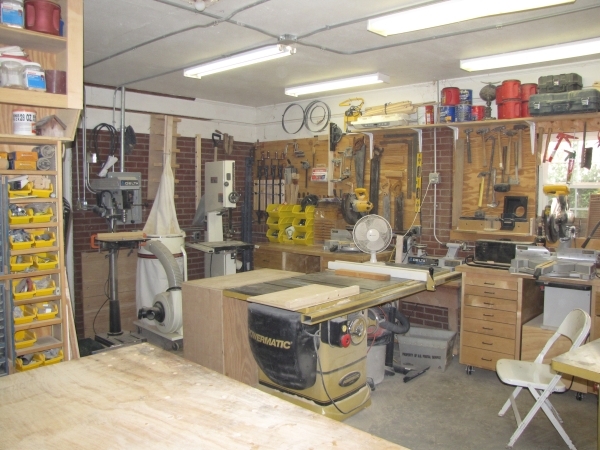 At the time I had a fair assortment of hand tools, a couple of vises, a router, a laminate trimmer, a biscuit jointer, a circular saw, a hand drill, an orbital sander, and a mitre saw. Before that I did most of my woodworking on the open carport, in the yard, or at the plant. I also have done a fair amount of whittling in my chair under my favorite oak tree in the backyard. About three years ago I purchased my Powermatic table saw, my Powermatic 8 in. 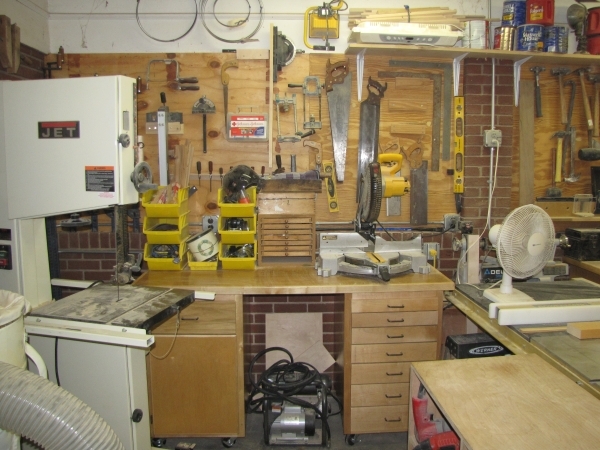 joiner, my Jet bandsaw, my Dewalt scroll saw, my delta lathe, and my Delta drill press. Along with these I aquired my little air-compressor and a few nail guns, and a few more power tools, clamps, etc. Of course I have always been a tool collector and will be until I die. So every week or so I add something else. I have purchased quite a few tools on Ebay. Although I am not a real experienced carver I have dabbled with it off and on for many years and have a nice collection of carving tools. When I purchased these tools I had already carved off a quarter of my little shop so that my wife could have a little space for a freezer and a little storage. Aren’t I a wonderful husband? 🙂 So now one half of my shop is about 11×19 and the part where the work table is is about 7×11. My wife’s little freezer/storage room is behind the storage shelves. So I have a very small shop but it beats no shop at all and I have managed to make some cabinets and bookcases in it along with various other things. The other complicating factor that I had to contend with until recently was that to enter the back of my house a person had to come strait thru my shop. Now we have another back door. For about a year on the weekends I have been working on the inside of my house and I was able to make a few built-in cabinets but I haven’t had a lot of oppurtunity to do much other woodwork in the past year other than some shop improvements. I’m in the process of building some new cabinets with drawers and doors (edit: this has been completed) that will replace the two wall cabinets where I have the two miter saws. In addition to the drawers there is an empty space under the top in the center of each cabinet and in one of those spaces I will have a roller cabinet to hold my router table and all of my bits and router tools and in the other I will have a roller cabinet for my air compressor, my staple guns, and all of my nails and staples. This should be a good addition to my shop and should keep me from having to pile things on my table saw. As you know no man should pile stuff on the top of his table saw and he should keep the top nice and clean. However, I have to do these things because of the size of my shop and because of all of the tools and other stuff that I have. After I finish with these improvements this weekend or next I will have an additional two compartments behind doors and 20 to 24 additional 22 in. deep drawers. My table saw will thank me and I will be a little less embarrassed about my shop clutter. 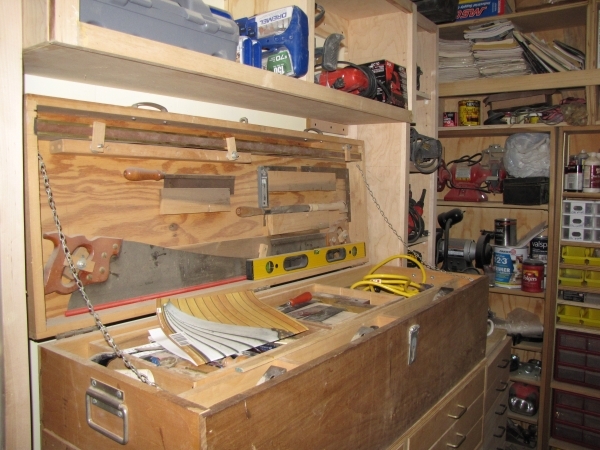 Two further improvements I plan to make very soon are some wall tool/storage cabinets along the wall behind my chop saws. And also some small tool boxes to go on top of the new cabinets that I just spoke of. I also plan to build at least a 10×12 storage shed just outside the shop. This will have a loft where I can store some lumber and I can store some jigs, fixtures, hardware, and supplies inside the shed. Hopefully, in a year or so I will be able to add on to the front of the shop another room 12×18. When I do this I may or may not bust out the wall at the same time. I might leave it a separate room with a door connecting both. I will put much thought on it. I suppose that I would be called an intermediate woodworker. I have been setting up and maintaining all sorts of woodworking and metalworking machinery in two woodworking plants for the last 40 years. We make architectural moulding now. Before this we made motel hotel furniture, nursing home furniture, and furniture for the consumer trade. Obviously this is not antique reproductions (which is what I would really like to build as a hobby) but it has allowed me to become compitant with a wide assortment of woodworking and metalworking machinery. I was the setup man, the maintenance man, and the prototype and jig maker. We also have a machine shop and I have actually done more machinist work than I have done woodworking. Occasionally I have built special machines for our plant. I have also been the moulder knife grinder and template maker for about 8 years before we finally trained another person to grind the knives. I’m 60 now. Where did all of those years go? :-[ Now I want to make some nice furniture as a hobby. It’s something that I have always wanted to do. I have been a work-a-holic all of my life but now I have at least the weekends free. I hope that I can do some quality woodworking now – just make some nice things for my wife and children before the Good Lord decides to take me on home. Nice workshop, I really like it, By the way, 60 is just the beginning…, have fun there…. That’s a sweet shop. Look forward to more blog entries and hearing about your adventures. That shop is laid out nicely. 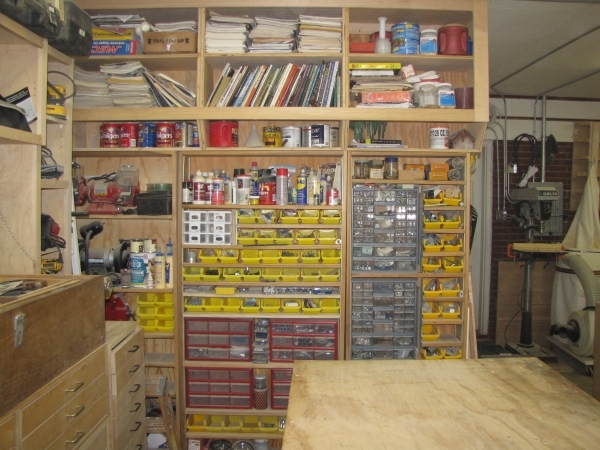 You have ample room to do most any project, and I really like you choice of tools. Not Sure how I got here. But here I am LOL, I’m a member of LumberJocks, and a fan of Charles Neil. On the webb relating to woodworking I go By DocSavage45. Had illusions/delusions of making furniture for a living. Now I am recognizing my amateur status. Have pretty good construction and finish carpenter skills, and I have built and rehabbed a few houses. Figured out how I got here. LOL Your an LJ too. 🙂 Nice site! Vet nice workshop, I have only started and it seem very challenging to get a good layout. So I am still moving everything around to get the right workflow. dejaveau! LOL! You are really organized! for being a JHellavawreck! What a nice shop Wreck. I love it. I like your shop and your attitude. I am DonB on Lumberjocks. Somewhat older than you are, but we have little to say about what age we are. Enjoy making your sawdust, it calms the soul doesnt it? Very nice shop! Well organized and can see you built many of the fixtures, cabinets, etc. I would be very nice if at some future time you could post a plan view of the shop. My shop, primarily as the result of large power tools being added over years is, I guess lacking continuity would be a complimentary way of putting it. I am interested in the layout of shops as function of woodworking processes from unloading the lumber to the finishing. Well done and thanks for sharing! Nice shop I appreciate your organizational skills. 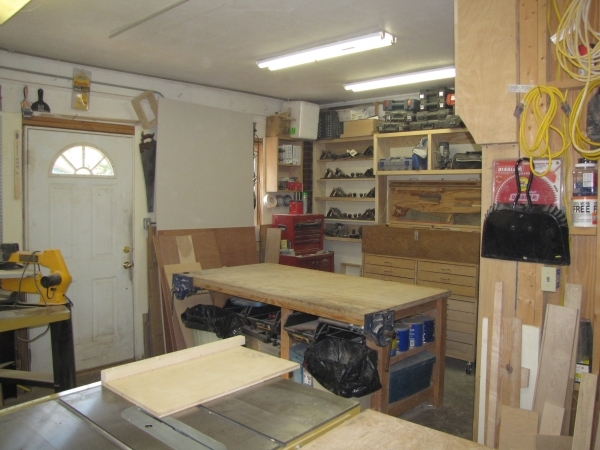 Well-organized and clean – my shop is neither of those things!